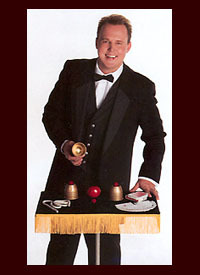 This artist is not only charismatic but has been dazzling audiences with his juggling, magic and illusions since 1980. His close-up magic and walk-around is unsurpassed and his fast-paced one-man show is always a crowd pleaser. He will ride a unicycle, completely blindfolded while juggling swords; he also performs skilled manipulation of steel rings, dramatically linked and unlinked. He can also perform a grand illusion show that is sure to be a crowd-pleaser.